MaxxECU - Top of the line engine management system. MaxxECU is a Swedish based company, developing and producing our own market leading engine management system. Made by professional tuners to be the most powerful, easy to use and flexible engine management system ever made. MaxxECU is designed to give optimal performance on the track and on the street. Built-in fault diagnostics and engine protection as standard. MTune, the modern and flexible PC software is used for all configuration, tuning. MDash, Android app, displays all engine data to the user. Inputs also possible. Are you missing something? Please contact us! •MaxxECU Pinout (MINI CAN note). •Audi S3 1.8T 2003 (ME 7.5) (changelog update). •CAN Inputs (more examples and features). •GM LSx terminated engine harness update. •Launch control (new cut mode). •Nitrous Stage (solenoid test feature). •BMW E46 330i (MS 42/43) documentation. •User PID enable control digital input. •Ford Focus RS/ST 2010 (ME 9.0) Plugin. •Fuel/ign cut and ignition retard reasons. •Jeep Cherokee (MJ-XJ 19) trigger. •CAN System Fuel Consumption Meter. •Fuel pump priming time, used by the fuel pump relay output. •CAN OBD-II input feature to read engine data from the OEM ECU when using a MaxxECU as a piggyback ecu (IAT, CLT, TPS, MAP, Lambda). •ME 7.5 OEM CAN protocol update: Smoother RPM output in dash. •Added the ability to control digital inputs directly from User CAN Inputs. •Added external CAN wideband controllers: AEM X-series and MOTEC in the lambda sensor inputs. •Added external CAN wideband controler (user defined) in the lambda sensor inputs. •Added the ability to activate a digital input function directly in the bluetooth settings, switches. •New trigger: Single pulse per 720 degrees. To trigger piggyback installations from a stock injector or coil. •Increased the number of User CAN Inputs to 24 channels. •Trigger pattern generator to output trigger pattern to test MaxxECUs and other ECUs. •Fixed a bug where gear 6 didn't work for the Analog Gear position input. •Fixed a bug where AC output was not reactivated if the AC reactivation time was set to "0.0". •Fixed a bug where the error code 84 accidentally was triggered on some vehicles connected to the CAN-bus. •Differential PID for CO2 boost control. •Added separate settings for boost duty and drop mode for launch control stage 2 and 3. •New User Stepper Motor output to control stepper motors. •New Launch control cut mode (cut % from table). •New Nitrous Stage solenoid test feature. •Honda K20A2 trigger update to sync better during cold engine conditions. •Fixed a bug where some trigger systems on MaxxECU MINI did not work properly. •New error code: 47 - External lambda sensor error. •New digital input function: External lambda X, error. •New digital input function: External lambda X, valid. Note: Always use our latest software version (currently 1.121), which contains the latest features, fixes and improvements. •NHRA compliant firmware available (Special license required, contact US distributor Aussie Imports LLC (us-sales@maxxecu.com) for more information). •New User PID output function. •Fixed a bug with User Output 1-6 not showing the correct settings in MTune. •Fixed a bug causing DIN 1-2 not working as CAM/HOME input or other pulsed input functions on the new MaxxECU MINI. •Fixed a bug where the GP RPM limit in rare cases prevented engine starts. •Fixed a bug where the RT-value "Knock correction accumulated" showed incorrect values. •Fixed a bug where PDM wipers, low speed and wipers high speed input accidentally was mixed. •Fixed a bug where tachometer test output feature did not use the adjustment table if set to table. •Fixed a bug where the internal wide band sensor accidentally used the manual free air calibration data value on MaxxECU PRO WBO 2 under very rare circumstances. •"R" keyboard shortcut is now back in whole system to erase all stored error codes from anywhere in MTune. •Official support for MaxxECU MINI. •Mustang 2011 OEM CAN protocol update. •New pulse single output mode in Diagnostics --> injection and ignition output test. •New setting (Max speed) in the Ignition lock/idle control settings. •Primary and Secondary injectors 9-12 are selectable on general output config. •Analog input functions and wheel speeds can be set directly from the CAN input system. •Tachometer adjustment from a table on the tachometer output function. 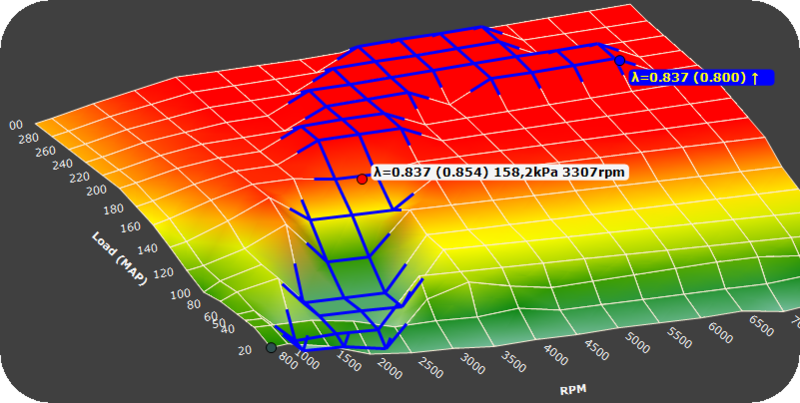 •Gear calculation based on RPM drop (for dragracing), Speed/Gear. •Hides any VVT errors when no VVT is enabled/visible. •Support for Can Keypads with multicolor LED. •New trigger: Honda CBR1000RR (crank + home). •Fixed a bug causing incorrect autotune operation if the operation was repeated on the same area. •Fixed a bug where the incorrect idle duty was used during crankning when the After Start Duty was set to Table. •Fixed a bug where the GPO RPM limiters didn't work as expected with INJ cut method. •Fixed a bug causing slow EGT update speeds on RACE ECUs (manual firmware update required on older units). 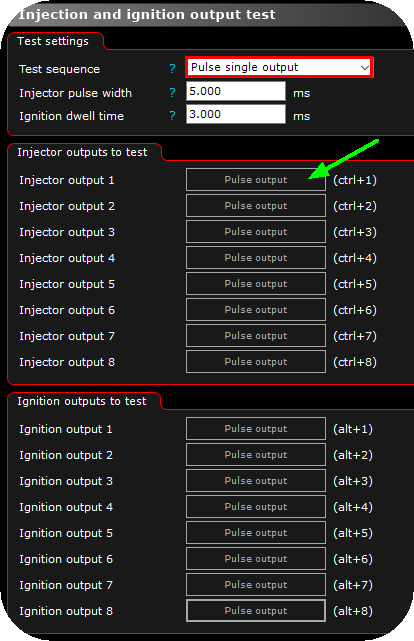 The new pulse single output test sequence in Diagnostics --> injection and ingition output test. Tachometer adjustment from a table on the tachometer output function. Analog input functions and wheelspeeds can be set directly from the CAN input system. •Shiftcut minimum enable RPM lowered to 800rpm. •Changed so the nitrous RPM can be set to 0 for Nitrous testing purposes. •Fixed a critical bug where knock control feature did not function properly. •Fixed a bug with unhandled exceptions with unexpected axis handling. •Fixed a bug with unhandled exception when changing measurement system and a logfile was opened. •Fixed a bug where the new cut/retard reasons in the live logger changed with the realtime value, not the actual logged value. •Fixed a bug where the new cut/retard reasons didn't show correct reason with Nitrous. •Fixed a bug where Surface 3D view not reloaded the view after a "inverted view" was requested by the right-click menu option. •Fixed a bug where Surface 3D view not reloaded the view after a "load from file" in the 2D+3D mode. •Fixed a nasty bug which we accidentally added in the last minutes before launching MTune 1.116, causing an unhandled exception when clicking on any axis values in 2D mode. This unhandled exception dialog appeared in MTune 1.116 when you clicked any axis value. Press Quit, and update to MTune 1.117. - We are truly sorry about this, we are not perfect, but we are committed to total excellence in our products. •New option Idle control settings to use both ignition an air to control ignition (dual mode). •Local autotune will now only affect the closest cell (not the four surrounding ones as in earlier MTune versions). •Autotune from logfile, change of visualization on both 2D and 3D. •Option to hide infrequent trigger errors. 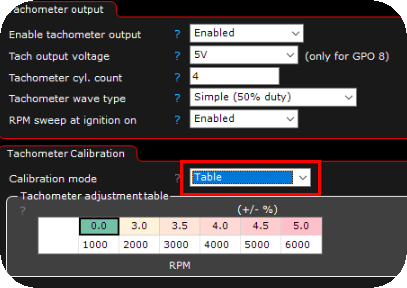 •ECU power hold user time can now be set with a table or a fixed value. •New GP RPM limit tables added. •New Alternator control output function added. •Automatic change to Optimal or High Performance Windows Power Plan during MTune startup as default (with an option to turn it off). •New RealTime Data value: Fuel/Ignition cut and ignition retard reasons. •New RealTime Data value: Lambda target error. 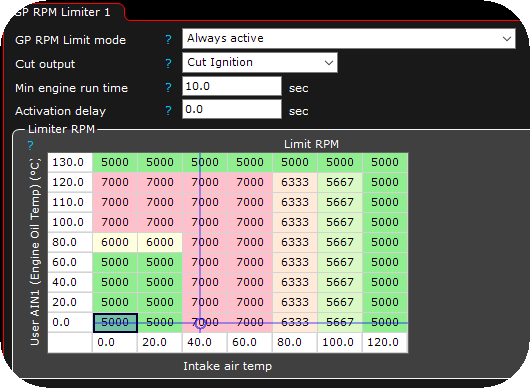 •New RealTime Data value: Engine max RPM (resettable with a button in engine counters). •New RealTime Data value: Engine max MAP (resettable with a button in engine counters). •New RealTime Data value: Engine total time over limit (resettable with a button in engine counters). •New RealTime Data value: Engine total time on launch (resettable with a button in engine counters). •New RealTime Data value: Engine-Driveshaft Ratio. •New RealTime Data value: Driveshaft-Engine Ratio. •New error code: MAP-sensor error. •New compressed log-file format (.MaxxECU-Zip-Log) which includes the tune file. •RPM as axis in power management system (speed was the only option before). •New setting for the fuel pump priming time, used by the fuel pump relay output. •New setting to idle up before start of the radiator fan output in idle control settings. •VVT duty % compensation based on voltage. •Added option to use a table to set a the locked idle ignition advance. •Feature to create base curves for the power management system. •Added Minimum engine run time option to the advanced warning system. •Changed the minimum Cut above RPM value in the advanced warning system, to be able to use the warning system even on idle or engine startup. •New setting to disable Power Management and Traction Control when activating the digital input function secondary rev-limiter (can be used as a ”Burnout Limiter”), setting available in the rev limit. •Lowest MAP value that can be used is changed from 20kPa to 0kPa. •Increased allowed PWM frequencies to 20kHz on all PWM outputs. •Rate of change channels that can be enabled for any RT-value. •Added an option to lock cells in tables. Locked cells can't be changed by the autotuner or by key shortcuts. •Improved dialog to add/remove cells when rescaling an axis. •New keyboard shortcut to switch between 2D/3D is the key "D". •Pressing ESC key anywhere in MTune, sets focus on the settings tree view. •2D tables selections synced with 3D selections. •Surface 3D: Now available for ALL tables. •Surface 3D: Wire frame mode update. •Surface 3D: Options now in a right click menu instead. •Surface 3D: Improved color highlighting. •Surface 3D: Change selection with SHIFT+arrow keys. •Surface 3D: Local autotune with one cell only (before 4 cells). •Surface 3D: When selections moved to the ends, the selections will shrink. •New trigger: 18-2-2-2 Jeep Cherokee (MJ-XJ 19). •New trigger: Toyota 1GR-FE, 3UR-FE. •New trigger: GM LT5 gen I (8+1 on crank). •OEM CAN protocol update: BMW E46 MS43. •New OEM CAN protocol: Nissan Patrol Y61. •New input function: CAN System Fuel Consumption Meter. •New input function: CAN System Torque Value. •Fixed a bug where multiple cells was selected, typing x,x caused just one cell to change (x.x worked). •Fixed a bug, RealTime Data value for Injection event start angle (ATDC) was misspelled as DBTC (but values was correctly logged as ATDC). •Fixed a bug where an unpredictable saving of log viewer settings was triggered. •Fixed a bug where ignition output coil duty was not displayed correctly in RealTime Data, output states. •Fixed a bug when the log viewer added channels on a closed plot area. •Fixed a bug where counters didn't reset to the Min Value. New RealTime Data value: Fuel/Ignition cut and ignition retard reasons. New option to hide trigger errors that might occurs during engine start and shutdown, and errors that might happen "sometimes" and not repeatedly. In MTune 1.116 and later, MTune will check the current Windows power plan, and change to either Optimal performance or High Performance power plan in windows Energy settings, and then revert back when closing. Selectable length of the value traceline is available. If you want a less color full 3D view, the "wire surface" is an option for you. Right click menu options in Surface 3D view. 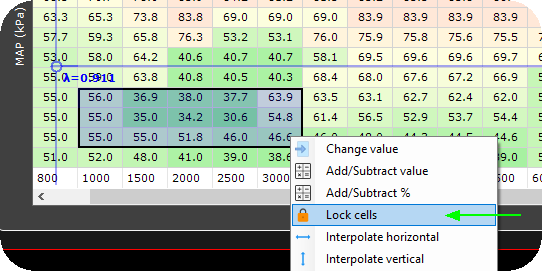 The new Locked cells feature, here a locked area highlighted in Surface 3D mode. 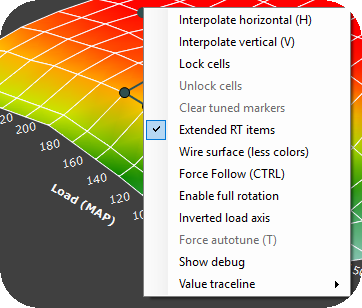 Example of how the Surface 3D view indicates the "tuned cells", for more information on tuned cells, see Autotune (from logfile) and Autotune (local). 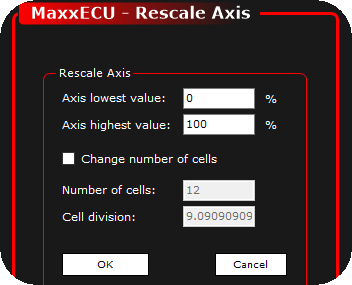 The new rescale option dialog, available after a right click on any axis value in 2D mode. The new GP RPM limiter, an extra RPM limiter can be added in the system, by using ANY axis source available in the system, anything can be done.